In my years of working retail, the memory of my bosses has long faded away. But, it’s those that I encountered (who were leaders) that really made a difference in my life. The latter group, by design, comes once in a blue moon. You have several bosses, but not all of them take time to make that connection. These individuals place a level of separation between them and their employees, whereas leaders strive for equality. So which one are you? Read on to find out more. First, a typical boss (in most cases) like to express their authority. They are in command of their employees and not on a level playing field. They know how valuable having this influence in the company is, and more often than not, they are not going to relinquish it. On the contrary, a leader inspires their employees. This individual wants their employee to expand their knowledge of the company, learning as much as possible. 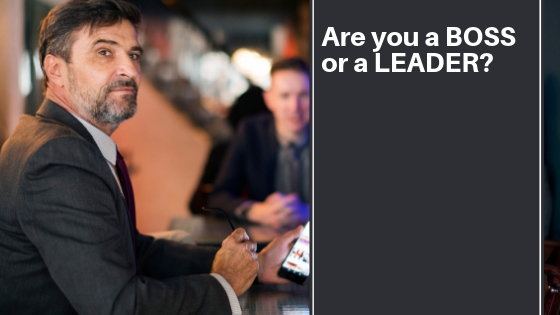 Many leaders go out of their way to invest in more training, sending their employees to conferences or having them shadow for a higher position. Likewise, they recognize strengths and weaknesses in their employees. They see potential in what they can do, and they want their employees to stay longer in the company. This means that job satisfaction is their top priority, at least one of one of the top priorities, that they strive to achieve. If you have a boss, you’re going to find that they are lurkers. They may tell you to place merchandise on a shelf, but they are always keeping a watchful eye. They may cross-examine and analyze each mistake their team makes. A boss drives the hammer for job perfection and comes down hard on employees that don’t achieve goals set before them. These employees, in turn, may be threatened by loss of hours, loss of a promotion or job termination. This happens frequently in retail. A leader, on the other hand, praises their team when they are successful. They help them celebrate their achievements. If they are lacking in achieving a goal, a leader restructures the goal for the team. This makes it more manageable. It gives the team more opportunity to reach success with not so much pressure. Many leaders do this with positive reinforcements. For instance, in one retail job, if we made a particular sales goal, then we extended our annual bonus. While a boss may listen to his or her employees, it doesn’t mean that those ideas will be implemented right away. A boss is always going to act in his or her best interest. They may agree that a goal needs to be restructured, or that more people need to be hired for the department. However, a boss is not quick to act. He or she believes the work should promptly be completed without complaints. Those that argue or resist are only hindering progress. But how does a leader approach this? A leader is going to take time to listen to their team. Their perspectives hold weight in the company. Leaders listen to their employees for feedback; they are quick to take action. Leaders want what’s best for the company, their employees and their customers. He or she knows they are not a one man (or woman) show. They need their team. And, if you don’t value your team, they’re likely to walk out the door. How a boss and leader commands is also different. A boss typically says “I need this done now.” When he or she barks, the team rushes to complete the given tasks. This is the boss exerting their authority, after all. When a project is not completed, or sales have taken a dive, the team is reprimanded for the failure. A leader, however, takes a more casual approach. They may say, “Are you able to complete it by the end of your shift?” If not, the task may go to another member of the team. If you are, and you don’t get it done, a leader may authorize overtime. A leader, you’re going to find out, is not quick to blame. If you are struggling to complete a task, then they are going to get someone to help you. Finally, many bosses (certainly not all, I hope) are standoffish. They make decisions on their own while leaving the majority of work up to their team. This backfires on them most of the time. In essence, employees hide situations that could affect the company or any of its employees. Bosses are uninterested in anything unless it directly affects them. On a final note, leaders are hands-on and work side-by-side with their employees. They, too, make decisions but they still get involved in what’s best for their employees. More often than not, this leads to problems being reported (and resolved) much faster. He or she builds up the team any way they can so they stay at the company for as long as possible. So, which are you? A boss or a leader? If you’re an entrepreneur with employees, then this an important question to answer. Even if you’re a small business, displaying leadership is a great way to earn the respect of others. Be a leader each step of the way!